We had a really good time in Kanazawa August. 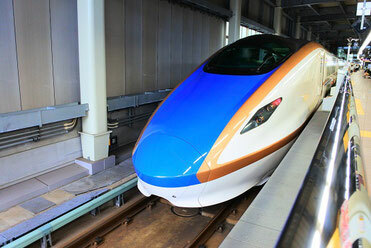 One of a reason to visit there is seeing Kagayaki shinkansen, that's new line ``Hokuriku shinkansen``. This train calls ``Hanayome-noren`` the word means blide traditional Japanese fabric dividers, it was tradional custom in Hokuriku. It's twice a day from Kanazawa to Wakuraonsen it is not everyday. 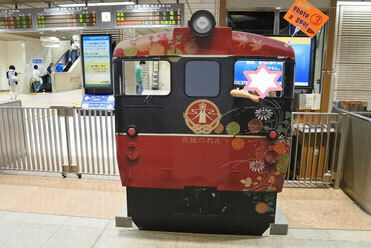 The inside of trains are decolated like the Wajima lacquer and the Kagayuzen it'a very beautiful. The fare is 2750yen. I would say this Tuzumi-mon is one of the reason the Kanazawa station is selected ``The World’s Most Beautiful Train Stations``. 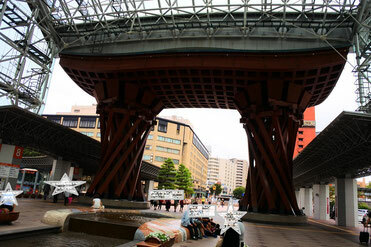 The gate expresses Japanese traditional hand drum. The next day we moved to Nagahama city Shiga and visited Yanmar museum I will post about it next. Have a nice TGIF ! !